Carnatic music is one of the oldest music in India. It predominantly belongs to South Indian states of Karnataka, Tamil Nadu, Andhra Pradesh. 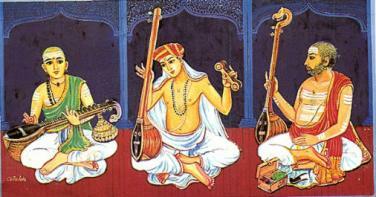 Purandara Dasa who belonged to Karnataka is called as Father of Carnatic music. His song composition is mostly in Kannada while very few are in Sanskrit. Purandara Dasa codified the beginners lessons and laid foundation syllabus for learning Carnatic music.It is mostly performed in groups and in the group it consists of a vocalists, person with violin, a person with mridangam and a tambura or veena which runs throughout the song. This music lays lot of importance on vocal music as most of the compositions are written to sing. Even when Carnatic music is played on any instruments it is performed in the way of singing. Carnatic music emphasises on raga and tala. Raga is the melodic formula while the tala is rhythmic cycle. Tala or Tal is tapping of hands on the legs in rhythmic movement in sync with the raga of the song. Laghu, Dhrtam and Anudhrtam are the three basic parts of talas which are performed by the singers while performing. There are seven talas they are Ata, Dhruva, Eka, Jhampa, Matya, Rupaka and Triputa tala. Raga is set of rules prescribed with definite melodic restrictions. These rules are basically for the scale and notes of the song and which note should be used more as compared to the other and which note should be sung along with gamaka or ornamentation. The main essential aspect of Indian Carnatic music is the improvisation in the raga. Some of the main forms of improvisation are Alapana, Niraval, Pallavi, Ragam, Swarakalpana, Tanam and Tani Avartanam. 18th century was an important period for Carnatic music as during this period there was trinity in Carnatic Music. Tygaraja(1767-1847), Muthuswami Dikshitar(1775/6-1835) and Syama Shastri(1762-1827) brought huge changes in the Carnatic music. Among the three it can be said that Tygaraja was the most prominent and prolific in nature. He composed various songs in his own mother tongue Telugu. Most of his songs are composed to lord Rama. 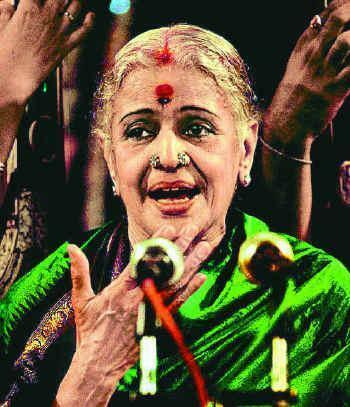 Many others have contributed for the development of Carnatic music some of them are MS Subbalakshmi, Bombay Jayashri, DK Patamal, Aruangiri Nathar and many more. Even though the main emphasis in Carnatic music is vocal music still some important elements in Carnatic music are Sruti, swara, raga and tala. Raga consists of seven notes are SA Re Ga Ma Pa Dha Ni SA. Ragas are further divided into Janaka Ragas (Parent Ragas) and Janya ragas (descendant ragas from parent raga). The composers of the Carnatic music have composed basically for teaching and learning the compositions through a set of encoded rules. Carnatic music is very rich in compositions. There is variety of compositions in Carnatic music which makes it beautiful and rhythmic to listen. Usually the music of Carnatic is devotional the composition acts as a path between devotion of people and god. Carnatic music consists of basically two elements one is the musical elements and the other being conveyed through composition. The Carnatic music is usually composed for singing purpose. It can be said that each composition brings the inner imagination and feelings of the composer. It also shows the personality of the composer and it is very important for proper composition of the music. There are different forms of composition, however he two important form of composition include Varnam and Kirti. Varnam is sung at the beginning of the concert. It is a mainly describes the whole of the composition. Known for its complexity varnam is basic foundation in Carnatic music. Kirti is the backbone of any Carnatic music and it varies in structure. It consists of three units called as Pallavi, Anupallavi and Charana. Even now Carnatic music is learnt as per the rules set by Purandara Dasa. In earlier days music was learnt in gurukulas but with modernisation music is learnt more easily now with students visiting daily or weekly gurus house. The Carnatic music is noted exclusively in tonic sol fa ( notation where every tone is given a name in relation to other tone). It is written either in Roman or Indian script to represent the notations. Further these notations are divided into columns. Carnatic music has melody and are sung in temples, during festivals at home or in a concert. The beauty of Carnatic music is that it is composed in a particular raga and when he singer sings that composition they do not deviate from the notes in the raga.